In other news, there has been work – a lot of it. Coursework tied in with revision is nasty at the best of times, and this isn’t the best of times as I have a toothache – the last of my wisdom teeth is coming through, all the others have subsided in a few days though, so I hold out hope this fourth and final time horay! Still it doesn’t help trying to read/write/program with what feels like a pneumatic drill crashing on the left hand side of your jaw. Ah well. It was with great sadness that I “handed in” my resignation as an administrator on the ADSLTech support site the other day, those with keen eyes noticed my links to the forum disappearing from this site and e-mailed me about it – well spotted! My reasons were more sad though, not as you might expect (pastures new – although more on that later, lack of time, etc. etc.) but changes in Safecom company policy (Safecom host the forum and it is primarily for their products) that literally was designed to make non-safecom administrators feel unwanted and undermined to the extent where they wanted to leave. Clearly Safecom didn’t like people who knew what they were doing who just happened not to “work” for the company being involved. Not only that, but they created a two tier system in which those who knew more didn’t rise to the top but got pushed aside in favour of company rhetoric and this clearly wasn’t going to work well. Over recent months, relations had been becoming more strained and it was clear that for the long term things were not going to work out. Still, as the longest standing forum administrator posted “It was fun while it lasted”, and indeed they were right. I have had many freebies from Safecom, got involved in a lot of things, been thanked personally (by e-mail anyway) by dozens of users who initially couldn’t get hardware working, been invited to a technology show (although I couldn’t go), and best of all met a superb group of people whom I am fully in touch with and have in fact gone on to design, build and run a new technical support forum, RouterTech as a team. You can read more on the new site in my blog on the subject. 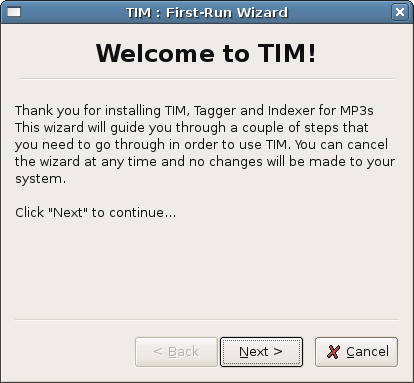 An alpha version of TIM (Tagger and Indexer for MP3s) – a project for my computing course, has been released. Please feel free to download, test and evaluate this version of the program and submit feedback and bug reports back to us for improvements to be made before the beta and eventually final releases of the program. Was walking past the weir at the Clarence Dock canel connection this morning, and I saw a large number of police officers and a fairly large cordon over 3 bridges and a fair section of the canal around that area. There were police divers entering the canal on the opposite bank and a forensics tent over there as well. I had to take quite a detour to get around it all, but I couldn’t see what it was all about and the officers on duty weren’t saying anything. One assumes it’s some kind of murder enquiry and they are looking for a body. Just speculation of course though. If anybody knows anything about this or spots an article on the web giving some information, then please post up about it. Its the little things that really make an application look good and perform at its best (especially when you have the back-end stuff working to a good standard), which is why getting the “First Run” wizard working made me really rather happy. When you run the application, a check is made to see if the database (with mp3 info and application variables in it) exists, and if it doesn’t it is created and initialised with the variables the user has selected in the wizard. Furthermore the application won’t start if you don’t complete the wizard once, so it means it never starts without its variables. Once again for those that like the eye candy…. There has been a long-standing bug with TIM in that the Re-Index function would re-build the index of files and so the database (and show a nice progress bar as blogged about all those weeks ago), but the problem was, it wouldn’t actually purge the list shown on the screen and re-populate it with said revised data. Any attempt to do so resulted in nasty errors that simply impeeded progress on other fronts. Its official; I will definitely be going to see Marlena Shaw live on Saturday as I picked up my tickets today. James will also be coming with me – he’s coming from St. Albans especially for the occasion, and why not indeed, Marlena Shaw is a superb soul singer and it should be an amazing night. I swear its what I’ve been living for this week. In other news, I’m revising – hard. Spent all day today in the library covering a variety of enthralling topics in the field of computing, most notably recursive algorithms and entity relationship models. Its hard getting into the habit of good quality daily revision, but I seem to be doing ok with it, and with plenty of time to go until the exams I should be fine. The launch of RouterTech has gone well, and we have already had a number of registrations and support requests. Its going to take a while to bed down, and the team are still getting to grips with the running of such a site, but it’s early days and we’ve all got to start somewhere. I look forward to the day all of us on the team can look back and say the work was worth it. Business is generally going well; I have had several people contact me over the last few days, some of whom I already knew, some I didn’t, about having websites built. This is always a good thing as it helps to pay for my expensive gig attending habits. It also keeps some of my other sites online and advertising free. I sign off this post with a number of software development tasks in hand. Most notable is my python project, but as I realised the other day, I have a number of other things on the go that really haven’t seen enough of my attention in recent weeks. Oh well, back to the grind-stone as they say.